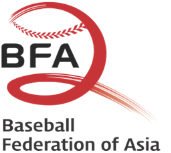 Baseball Federation of Asia (BFA) announced 8 competing teams each for the U-12 and U-18 Baseball Championship in 2018, subject to their completion of required formalities by BFA. Japan, Korea, Chinese Taipei, Pakistan, Hong Kong, Indonesia, Sri Lanka, and India. Both　Championship will serve as a qualifier to 2019 the World Baseball Softball Confederation (WBSC) World Cup U12 and U18, and the top three from each tournament are eligible to participate in the World Cup.